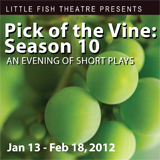 Pick of the Vine: Season 10 launches Little Fish Theatre's 2012 season with an eclectic and entertaining group of 9 one-act plays. Chosen from nearly 500 submissions from 40 states and 9 countries, the entire cluster of 5- to 15-minute plays are performed each Friday and Saturday night with additional performances on Sunday, February 5 and Thursday, February 16. Performances run from January 13 - February 18, 2012.Over the years, the plays have featured men on crosses, a boy with wings, and even a group of bugs in a jar. This year's collection offers offers humor, passion, poignancy, and wish-fulfillment in settings as diverse as a spa, a church, the parking lot of Yankee stadium, and the edge of a bathtub. According to the site "Theatre in LA," Pick of the Vine has a reputation among playwrights as the short play festival to be in, and among theatre-goers as a show not to be missed.